Oliver Stanley "Olly" Murs (born 14 May 1984 in Essex, England) is an English singer-songwriter. He achieved second place on the sixth series of The X Factor in 2009. In early 2010, he was signed to Syco Music and Epic Records, who are owned by Sony Music. After he toured with X Factor Finalists tour, he began recording his debut album. Murs' debut single, "Please Don't Let Me Go" charted at number one on the UK Singles Chart, after releasing it on 27 August, beating Katy Perry's "Teenage Dream" to the #1 spot. 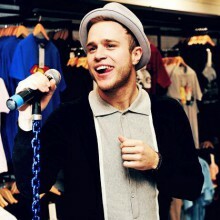 Respected fans if you are reading this, you are on on the page of the singer olly murs in our eLyricsWorld. Our database consists of data about 52389 artists throughout the world as well as 829824 songs 128 of which are from olly murs. Besides the the biography of the artist, on this page you can see short piece of information about them, covers date of birth, genre, record label Be conversant with all the development with olly murs by adding RSS link. If you prefer you could directly visit the page you are on right now and check out the latest songs about the singer.